Amnesty International published a report Democratic Republic of Congo: arming the east, on 05Jul05. New names surfaced as linked to Victor Bout: the Compagnie Aérienne des Grands Lacs (CAGL), and the Great Lake Business Company (GLBC) and various others. I was also interested to see various Antonov types mentioned: 9Q-CGQ, 3C-QQE and EL-WVA. Parts of this report has been reproduced below. In Rwanda, an airline company named Regional International Air Services was formed in 2003 operating an aircraft from Moldtransavia, a Moldovan company whose operations were suspended after a UN report on violations of the arms embargo on Liberia linking Moldtransavia to the network of arms trafficker Victor Bout.Two other Antonov aircraft registered in Rwanda to Regional International Air Services were reportedly exported to South Africa in December 2003. Jetline Inc, also listed as Jetline International, whose fleet includes various aircraft from the former companies under the effective control of Russian businessman Victor Bout, operated the BAC 1-11 aircraft registered as 3C-QRF. There also appears to have been collaboration between arms traffickers in the DRC and Liberia. In 2002, Ducor World Airlines of Bulgaria sent a request to the DRC civil aviation authorities to fly a military cargo from Serbia to Kinshasa. The DRC authorities told Ducor that the address in the DRC that Ducor used for military services was wrong. [photo © Olaf Juergensmeier] Ducor re-submitted its request to fly the cargo but, after the DRC aviation authorities apparently gave no response, the cargo was said to remain undelivered. However, on 13 March 2003, the DRC embassy in Serbia and Montenegro told the Serbian Ministry of Defence that a DRC End User Certificate was indeed genuine. The Serbian government reported this to UN officials investigating eight illegal arms flights by Ducor brokered by a Belgrade company, Temex, to Liberia between June and August 2002 using false end user certificates of Nigerian origin. Efforts by the UN to confirm with the Kinshasa authorities the authenticity of the end user certificate remained unsuccessful by the time the UN Report on Liberia was issued but the chief executive officer of Ducor World Airlines, Duane Egli, was placed on a UN travel ban list in October 2004. The other main transporter of arms from Serbia to Liberia named by the UN in 2002 was Aerocom, a company closely associated with the trafficking network of Victor Bout. Ducor World Airlines, previously Liberia World Airlines, has reportedly supplied military equipment to Burundi using the Tanzanian town of Mwanza over the past few years. "Fascinated to see Duane Egli's name surfacing in your story on your site about the arms smuggling and Victor Bout. Egli was involved in Sanctions Busting some years ago when he took on the job of refurbishing one of Colonel Ghaddaffi's aircraft - a Hercules, I think, at Ostend in defiance of US sanctions on using US aircraft parts on Libyan planes, Apart from Liberia World Airways, he was also involved with FAME, (Flanders Air Maintenance). " In feb.2006 I received the following: "He's a pretty colorful character. I worked for him in Fabens,TX in 1974 when he was in crop dusting and aerial repair. The previous summer I agreed to go with him down to El Savaldor "to pick up some spare parts" but the trip came to nothing. In his past he has flown a Mosquito and an Avro Anson across the Atlantic, flew the camera plane for the Battle of Britain movie, and flew in the Honduras El Salvador (socalled Football War) as well as in Africa during the Biafran/Nigerian war in the late 1960s. I first met him when I was working for the Confederate Air Force, then based in Harlingen,TX. He was one of the key players in getting a China Lake B-29 airworthy for the CAF. Would love to know what he's doing now." Duane Egli is a cousin of mine and lived about 1/2 mile from me and went to school together. We flew together a lot back then. The last I heard he is still living in Belgium, as he is not allowed back in the US. He contacted my brother several years ago and left a message on the machine, but did not leave any contact number. I would like to see him again. We had some good times when we were young. "Duane and my Dad were buddies. This blossomed after the Battle of Britain movie, when he relocated to Harlingen,TX, getting involved with the Confederate Air Force museum. Duane helped my dad get the Griffon going on his Spitfire, TZ138. TZ138 is an FR Mk.XIV E model (the one that raced in Cleveland in 1949, #80). My dad was also financially involved with the Avro Anson that was flown back from England. We were also involved wih Duane in Fabens, up to the time he ran afoul with the authorities, and left the country. Duane is a very charimatic and colorful person, creating lots of excitement around all of his endeavors, but you be the judge on morals. I thought that I would add that Duane started life out as a member of an Amish, or Menonite community, not sure which, but he somewhat maintained that personal appearance. Amish communities do not enjoy the pleasures of life, use a horse and buggy for transportation, and are not involved in politics. Duane would be the ultimate 'going yankee' story... He was also selling and delivering unauthorized aircraft as well as weapons to Central American countries in the late-1960s and early-1970s. I would like to see him again some day, although it is not likely this is going to happen." The Ugandan government admitted in 2003 that an eastern European business network was very active in the arms and natural resource trade and that Lt-General Saleh had continued his interest in Air Alexander International contrary to the President’s directive. Lt-General Saleh and Major-General Kazini, former chief of staff of the Ugandan People’s Defence Forces (UPDF), were accused by the UN Panel on the DRC of facilitating international companies in eastern DRC to illicitly exploit the DRC’s natural wealth - including diamonds, gold, timber, ivory and coltan - while commanding Ugandan forces there. Saleh, his wife and Kazini were linked in the UN report to a company called La Société Victoria (the Victoria Group).The most prominent foreign businessman identified by the Porter Commission as being involved with senior UPDF officers was Russian national Victor Bout who is accused in various UN reports of trafficking arms to UN embargoed destinations from Bulgaria, Slovakia, Ukraine, Kyrgyzstan and other countries. The activities of Russian businessman Victor Vassilyevich Bout and his associates shed light on the process of arms trafficking into Central Africa. Bout has been linked to the arming of members of the DRC government alliance, as well as various armed opposition groups supported by Rwanda and Uganda. Since the early 1990s, Bout has overseen the development of a complex network of over 50 aircraft, several airline companies and freight-forward companies operating in many parts of the world, and he has been under investigation by police agencies and the UN for suspected involvement in sanctions-busting activities in Sub-Saharan Africa. UN officials have accused Victor Bout of using the United Arab Emirates as a permanent base but using many "flags of convenience" and sub-contracting arrangements for his aircraft to facilitate illegal arms and diamond smuggling activities, particularly in Africa. Victor Bout's aircraft were allegedly used to take coltan and cassiterite out of DRC; to bring supplies into mining sites in DRC; and to transport military troops and equipment. However, he has never been prosecuted for arms trafficking because of the inadequate laws of most states to regulate arms brokering and arms transporting activities. In April 2005, the US Department of Treasury froze the assets of 30 companies and four individuals linked to Victor Bout’s violation of the UN arms embargo on Liberia, including Bukavu Aviation Transport and Business Air Services, both of the DRC. In 2000, the company San Air, which mainly used Boeing 707 and Ilyushin-76 aircraft, supplied arms from Bulgaria to the DRC government. In February and May 2004, Jetline International, an aviation company based in Ras al Khaimah (UAE) and Tripoli-Mitiga (Libya) whose fleet includes planes formerly operated by Bout’s companies leased a cargo aircraft for arms deliveries to the DRC government. Another company, the Moldova-based Aerocom, already involved in illegal arms shipments to Liberia, has reportedly based an Antonov-26 (ER-AWN) aircraft at Kinshasa airport since September 2003. Aerocom’s operating licence was cancelled on 6 August 2004 by the Moldovan civil aviation authorities and Aerocom’s activities were taken-over by the Ukraine-based Asterias Commercial. The activities of two aviation companies based in Goma need close attention: the Compagnie Aérienne des Grands Lacs (CAGL), and the Great Lake Business Company (GLBC). A local Congolese businessman linked to RCD-Goma, manages the GLBC, but investigation by the UN Group of Experts indicates that a Russian businessman named Dimitri Popov runs the company as well as the CAGL and that he in turn is allegedly linked to Victor Bout. The UN Group of Experts reported that: "Numerous sources interviewed by the Group noted that the aircraft operated by those two companies were linked to the network of internationally renowned arms broker Viktor Bout through one of his frontmen, Dimitri Popov…Businessmen interviewed by the Group, who hire Mr. Mpano’s aircraft for cargo transport, volunteered that Mr. Popov was integral to the management of GLBC and CAGL operations and that they often negotiated directly with Mr. Popov on matters pertaining to the hiring of GLBC planes, even when he was in the United Arab Emirates or the Russian Federation." UN Group of Experts report, 25 January 2005, (S/2005/30), paragraphs 67-69, and see also APPG report, 24 December 2004, op cit: pages 21-22. An Antonov plane with Liberian registration EL-WVA has been used during 2004 by both CAGL and GLBC. On 30 November 2000, the Transavia Travel Agency, a company based in Sharjah, U.A.E, sold the Antonov with manufacturer’s serial number OG 3440 to CAGL for "and in the consideration of the sum of USD1.00 only and other valuable considerations".The Transavia Travel Agency is considered to be a company belonging to the Victor Bout trafficking network and as such its assets were recently frozen by the U.S. Department of Treasury. This aircraft, EL-WVA also belonged to Bout’s company Air Cess and it was reportedly used to deliver arms from Kigali to the Rwandan army in Kisangani in March 2000. Research also reveals that during 2003 the same Antonov with serial number OG 3440 was being flown between Uganda and DRC by two other companies, Showa Trade and Santair Cargo Ltd, under an Equatorial Guinea registration number: 3C-QQE. [Photo © Torben Guse] The same aircraft with Liberian registration was stored in Sharjah, UAE, from February 2001 to March 2002 and then appeared with the new Equatorial Guinea registration 3C-QQE. In July 2004, an aircraft using the old EL-WVA registration was spotted at Kongolo airport in the DRC transporting arms and ammunition. 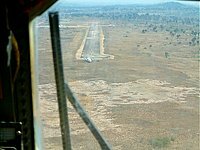 Previously, on 31 July 2002 an Antonov An-8 with the same registration overran the runway at Kalemie airport in Katanga, DRC. Another cargo plane used by GLBC is also considered to belong to the Bout arms trafficking network: the Antonov-32 with Equatorial Guinea registration 3C-QQT (m/n 1407). The plane, formerly registered in Russia as RA-48974, was sold and re-registered as 3D-RTB in 1997 to Air Pass – based in South Africa and Swaziland and owned by Bout’s brother’s Air Cess/Cessavia (based in Sharjah but registered in Liberia) and by Norse Air of South Africa. (266) Between 1999 and 2000, this Antonov 32 was illegally registered as TL-ACH (Central African Republic) under two of Bout’s connected companies, Centrafrican Airlines and the Sharjah-based San Air General Trading. Due to its illegal activities, Centrafrican was compelled to close. Its assets passed in 2001 to CET Aviation(another company reportedly in the Victor Bout arms trafficking network) and then the plane was again re-registered, this time as 3C-QQT (Equatorial Guinea), operated by the GLBC. In June 2004 the US State Department circulated a list of nine air companies linked to Victor Bout. The list names nine companies including Air Bas, Air Cess, and Jet Line. However, this has apparently not stopped the authorities in Rwanda and Uganda from allowing this aircraft to operate. The following case shows how planes that have been used by companies identified by the UN for violating arms embargoes the Security Council has imposed on other countries in the past are now sometimes re-circulating and relocating into eastern DRC, and how difficult it is in that region identify the cargo companies and their locations, registrations and leasing arrangements to ensure that they are operating legitimately and observing the embargo. An Antonov An-8 aircraft with the Sierra Leone registration number 9L-LEO was seen in Entebbe on 29 May 2004. Santa Cruz Imperial/Flying Dolphin Airlines used the Liberian registry for its aircraft apparently unknown to Liberian authorities until 1998. It also used the Swaziland registry until the Government of Swaziland de-registered them in 1999. A total of 43 aircraft were de-registered… When the Government of Swaziland discovered that some of the aircraft were still operating it sent information to the Civil Aviation Authorities in the United Arab Emirates where some of the aircraft were based, in part because of airworthiness concerns, and in part because it believed that the operators may have been involved in arms trafficking. The assets of Santa Cruz Imperial/Flying Dolphin Airlines were taken over by Dolphin Air. According to Dolphin Air, they sold two Antonov 8s, one of which was registered EL-AKY, for cash two years ago to a Russian, who repaired the Antonov marked EL-AKY using the spare parts of the other. According to Civil Aviation Authority of Sharjah, 9L-LEO left Sharjah on the 27 May 2004 operated by Dolphin Air for an unknown destination. It then appeared at Entebbe airport on 29 May 2004. Research shows that the registration 9L-LEO was issued by the Sierra Leone civil aviation authority to an Antonov-8 with serial number OG3410 on 22 March 2004, and was owned by a U.S. Oregon-based company called Simax LLC, using an address in Sierra Leone "c/o Africargo International/Inter Tropic Airlines". Africargo International paid for the Airworthiness Operations Certificate (AOC) that was valid until June 2004 but was not renewed. This indicates that the plane was flying in contravention of aviation regulations in the DRC in July 2004 without a valid AOC. The Sierra Leone authorities subsequently deregistered the aircraft in October 2004. The operator of the plane in DRC, KAL or Kisangani Airlift, said in May 2005 that his company was started in June 2004. He said that 9L-LEO was their first plane and that KAL was operating three planes, one of which recently crashed in the DRC, EK-26060. According to him, the real owner of the aircraft is the Dubai-based company Pusk Ltd. In October 2004, KAL claimed the plane was taken out of the DRC for maintenance and to renew the airworthiness certificate. Also in October 2004, the US company Simax tried to register an Antonov-8 in Burundi but failed. KAL claimed that the aircraft has since been registered in Sao Tome and Principe as S9-DBC, but the original certificate went missing according to CAA of Sao Tome. According to KAL, the same aircraft was parked in Nairobi for maintenance on 12 May 2005. UN report, January 2005, S/2005/30: page 19. "The Group obtained documents concerning the Antonov 12 aircraft registered 9Q-CGQ that indicated that the plane had been insured jointly, on 11 November 2004, in the name of Great Lakes Business Company, with the address listed as P.O. Box 315, Goma, and Ilex Ventures Ltd, with the address listed as Cassandra Centre, Offices 201 & 202, 2nd floor, 29 Theklas Lyssioti Street, P.O. Box 58184, 371 Limassol, Cyprus. The Group contacted the company in Cyprus by phone and was told that it could not release information to the Group until it had checked with representatives in Moscow. The Group subsequently received a fax from the Cyprus director, Petros Livanios, who stated that Ilex Ventures did not have any joint projects with GLBC and did not operate any aircraft jointly with GLBC in the region or elsewhere. Instead, Mr. Livanios noted that Ilex Ventures contacts with GLBC were "limited to several supplies of aircraft spare parts and units and [sic] single deal in resale of aircraft"." UN Report on Sierra Leone, S/2001/1015 of 26 October 2001. According to the UN findings, Ranjivan Ruprah, a close business partner of Victor Bout, also set up the ghost airline West Africa Air Services. The UN Panel obtained a copy of a contract agreement between West Africa Air Services and the airline company "Renan" based in Moldova for the leasing of a cargo aircraft that was used for violating the UN arms embargo. EL-WVA was operated by AirCess, delivering arms to Kisangani in 2000 and was also used by two Goma-based companies, GLBC and CAGL, as described earlier in this report. Letter from Antonov, Aviation scientific & technical complex, 4 June 2003, helps trace the link between EL-WVA and 3C-QQE. "Viktor Bout, an infamous arms trafficker known as the Merchant of Death, had at least a dozen shell companies incorporated in Delaware,Texas and Florida to cover up his weapons trafficking operation." Amazing, hiding right under the nose of the USA, the rightious policeman of this world! "The term tax haven may evoke images of exotic locales, but Panama actually ranks as the 13th most attractive spot for hiding assets, while the US lies third..."
"One of the surprises about the Panama Papers – the largest leak from an offshore tax adviser in history – is how few Americans have so far been exposed. The reason? It may be because creating a shell company in the US is easier than obtaining a library card. About 200 people with US addresses have so far been revealed as clients of Mossack Fonseca, the firm at the center of the Panama Papers leak. Compared with countries such as China, Switzerland, Russia and the United Kingdom, the number is small. The anomaly may be because it’s so easy to create a vehicle to hide your money and your identity in the US that there’s no need to mess with Panama, according to Shruti Shah, vice-president of programs and operations at Transparency International, an anti-corruption organization." PERHAPS FUTURE RESEARCH THROUGH THE PANAMA PAPERS AND LINKED SOURCES WILL REVEAL V.BOUT'S HISTORY AIRLINES?! !